We are always excited when Agriscaping makes headlines! Agriscaping has been featured in USAToday, USWeekly, Forbes and so much more. Here you'll find media events, featured articles and more. As AWESOME as spring is here in Arizona, it can still be a challenge to grow on a patio but not any more! Here are the Top 5 Patio Gardening Tips so you can have success this Spring! Oh my, is it BEAUTIFUL in Arizona! Everything is budding with life! So, are you ready to Power-Up your Flowers with these Top 4 Flower Gardening Tips? Spring is an AWESOME time to get your Garden On! Watch the video to learn the 7 secrets for improved success this season! 3 Simple Steps to Spring Gardening Success! Spring is here!!! The Sun, The Wind, and a bit of glorious RAIN! I LOVE this time of year! The 3 Simple Steps to Spring Gardening are in this video! While the rest of the world seems to be FREEZING under the “Coldest Temperatures in a Generation” We are sitting pretty with the Spring very near on the horizon and the BEST time to plant some amazing fruits! Check out the Top 4 Fruits to plant in February! These wonderful evergreen marvels are a great, no-mess addition to any Arizona garden, great around pools with a POP of tasty color! Check out my Top 7 Citrus in season this time of year and how to tell when they are ripe! Here are Justin’s TOP 5 Cold Kickers you Can Grow At Home that can both beautify your garden and help you curb the common cold this winter! We are Falling into WINTER and it’s starting to get COLD!!! Is your garden ready? Will It survive? If your tender plants get nipped by the frost they might never recover! The effects of frost begin at 40 degrees for some plants! Top 5 Fruit Trees For Your Garden! What's in YOUR Garden? Do you want to be able to walk out your back door and get a delicious snack, right from your own orchard? It may sound crazy to grow fruit in your backyard in Phoenix, but it's not only completely possible; it's easier than you think! Justin Rohner, founder of Agriscaping Technologies, joins Danielle Williams to show us how to get started on our own orchard. 4 Freaky-Good Halloween Garden Tricks! Perfect Your Scene and Protect Your Plants! While you may love to see a dozen smiling faces, framed in wacky costumes, running to your front door with cries of "trick or treat! ", your garden tends to cower. In the heat of an excited night out on the town, sometimes costumed youngsters will overstep their sidewalk and crunch a few garden flowers on their way. If you want to keep your home open to the fun of Halloween without sacrificing your prized blossoms, then listen up! Justin Rohner has all the tips and tricks you need to make your garden beautiful and safe this holiday season. What should you be planting this fall? How about some FOOD, Flowers, and FUN! 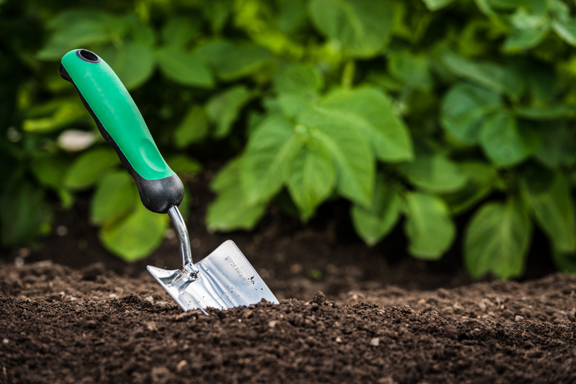 Join Justin Rohner for Green Thumb Thursday and the 3 Simple Steps to Fall Gardening Success and it all begins with healthy soil. healthy starts, and a healthy system. Pat McMahon meets up with Justin Rohner for a Farm-to-table favorite: Bitters Bar and Food in Scottsdale. It's a place far more fresh than you can imagine. From specialty herbs and greens to traditional veg grown right next door! The AZTV Team join Justin Rohner in his Scottsdale Gardens open to YOU and beautifully serving Chef Shelly at Bagels and Bialy's. Growing Eggplant, Garlic Chives, Purple Basil, Peppers, straw-basil Lemonade, and more!